some jackass ripped off my camera in portugal so i lost many of my pictures, including pretty much everything from rural france and spain where i cycled. on occasion, i've acquired some pictures from traveling companions who were with me in those areas. 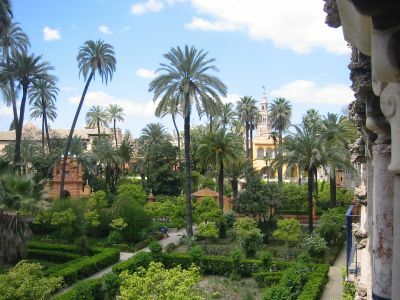 the following pictures of spain are from friends. stephanie came to visit me in spain. 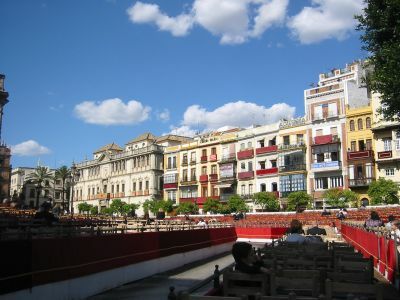 we rented a car and toured madrid, toledo, cordoba, and sevilla. 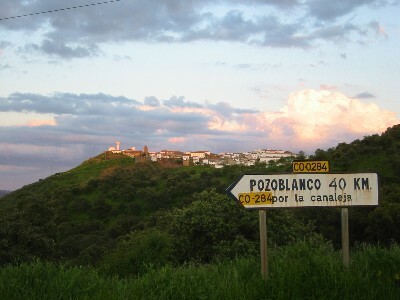 we drove past many white hill towns in andalucia, the south of spain. this is the town of obeja. 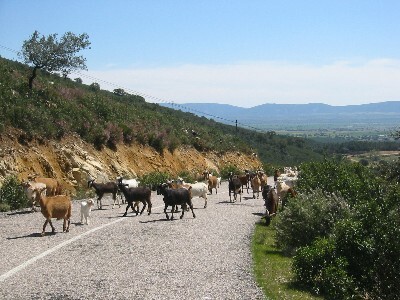 often while biking through spain i had to stop to let a herd of goats cross the road. here are some on the road from madrid to cordoba, spain. 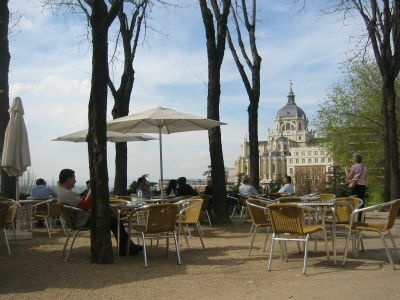 a street cafe in madrid. 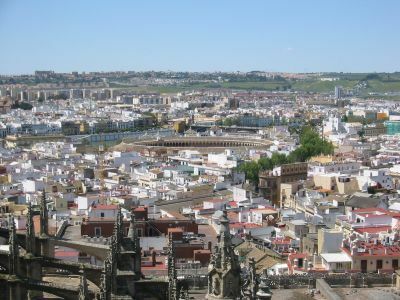 an overview of sevilla and it's bullring. 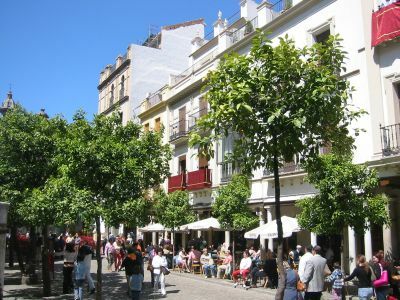 the streets of sevilla just outside of the bullring. 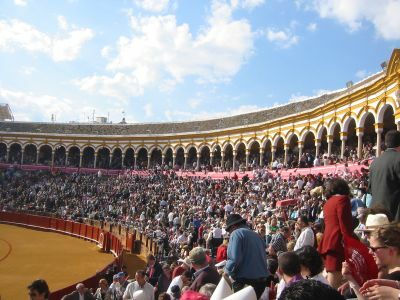 we went to see the first bullfight of the season on easter day in 2004. here is a view of the stands. 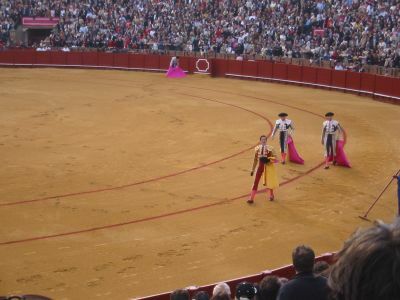 the matador parades around the ring after a successful kill. 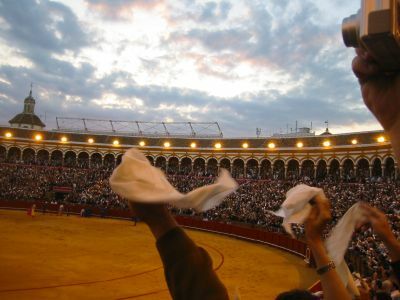 the crowd waving their white handkerchiefs to signify that the matador deserves one trophy, or one ear, from the bull that he just dispatched. 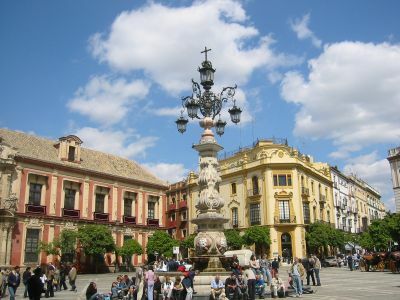 we were in sevilla during semana santa, holy week, which celebrates easter. 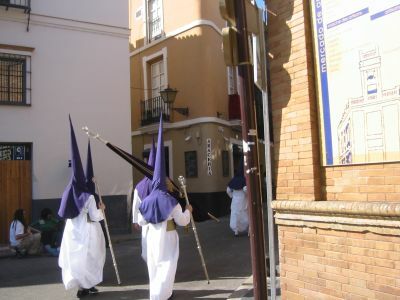 there are endless parades, paseos, of these guys carrying "floats" of jesus and mary. however, since i am from america, these guys looked like ku-klux-klan members which disturbed me highly. it was hard to change my view of the outfits, from something totally wicked to something totally holy. chairs and grandstands are assembled for viewing the long parades. 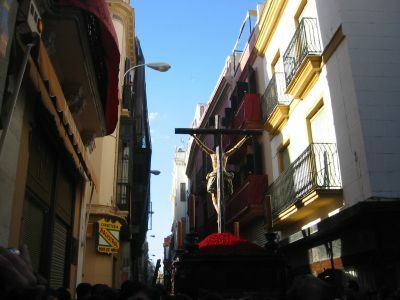 the streets are absolutely silent when the image of christ's crucifixion makes it's way through the crowd.